, a musical composer of great originality, was born in the palatinate, on the frontiers of Bohemia, in 1712, or as Dr. Bumey says, in 1716. His father, a man in poor circumstances, removed, during the infancy of his son, into Bohemia, where he died, leaving fris offspring in early youth, without any provision, so that his education was totally neglected. He had, however, an instinctive love for music, which is taught to all children, with reading and writing, in the Bohemian schools. Having acquired this knowledge, he travelled about from town to town, supporting himself by his talents, till he had worked his way to Vienna, where he met with a nobleman who became his patron, took -him into his service, and carried him into Italy, where he procured him lessons in counterpoint, at Naples, by which he profited so well, that before he left Italy he composed several dramas for different theatres. These acquired him reputation sufficient to be recommended to lord Middlesex as a composer to the opera house in the Haymarket, then under his lordship’s direction. He arrived in England in 1745, and, in that year and the following, produced his operas of “Artamene” and “La Caduta de Giganti,” with indifferent success. From London he returned to Italy, and composed several operas in the style of the times, and afterwards engaged with the Italian poet Calsabigi, with whom he joined in a conspiracy against the poetry and music of the melo-drama then in vogue in Italy and all over Europe. In 1764, when the late emperor Joseph was crowned king of the Romans, Gluck was the composer, and Guadagni the principal singer. 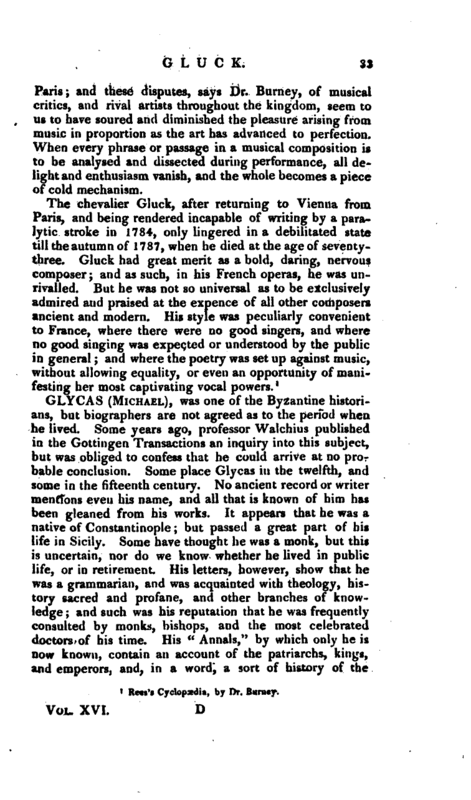 It was in this year that a species of | dramatic music, different from that which then reigned in Italy, was attempted by Gluck in his famous opera of “Orfeo,” which succeeded so well, that it was soon after performed in other parts of Europe, particularly at Parma and Paris, Bologna, Naples, and in 1770 at London. In 1769 he produced “Alceste,” a second opera on the reformed plan, which received even more applause than the first; and in 1771 “Paride ed Helena;” but in 1774, his arrival at Paris produced a remarkable era in the annals of French music, by his conforming to the genius of the French language, and flattering the ancient national taste. All his operas proved excellent preparations for a better style of composition than the French had been used to; as the recitative was more rapid, and the airs more marked, than in Lulli and llameau; there were likewise more energy, fire, and variety of movement, in his airs in general, and infinitely more force and effect in his expression of all the violent passions. His music was so truly dramatic, that the airs and scenes, which had the greatest effect on the stage, were cold, or rude, in a concert. The situation, context, and interest, gradually excited in the audience, gave them their force and energy. He seemed indeed so much the national musician of France, that since the best days of Rameau, no dramatic composer had excited so much enthusiasm, or had his pieces so frequently performed, each of them two or three hundred times. The French, who feel very enthusiastically whatever music they like, heard with great rapture the operas of Gluck, which even the enemies of his genre allowed to have great merit of a certain kind; but though there is much real genius and intrinsic worth in the dramatic compositions of this master, the congeniality of his style with that of their old national favourites, Lulli and Rameau, was no small merit with the friends of that music. 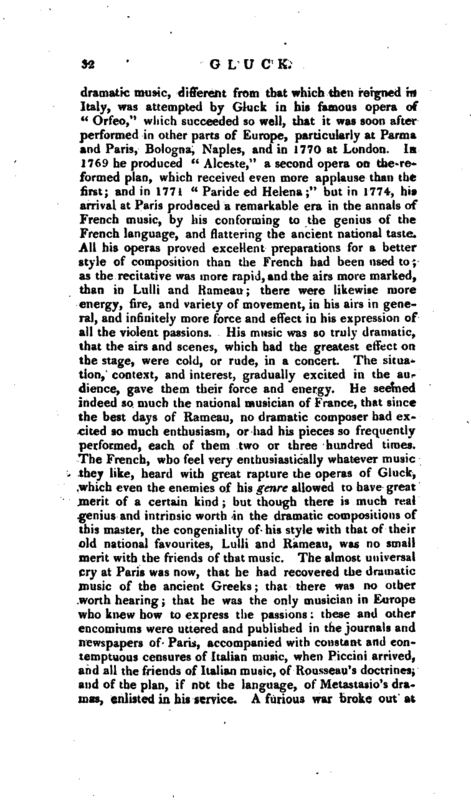 The almost universal cry at Paris was now, that he had recovered the dramatic music of the ancient Greeks; that there was no other worth hearing; that he was the only musician in Europe who knew how to express the passions: these and other encomiums were uttered and published in the journals and newspapers of Paris, accompanied with constant and contemptuous censures of Italian music, when Piccini arrived, and all the friends of Italian music, of Rousseau’s doctrines, and of the plan, if not the language, of Metastasio’s dramas, enlisted in his service. 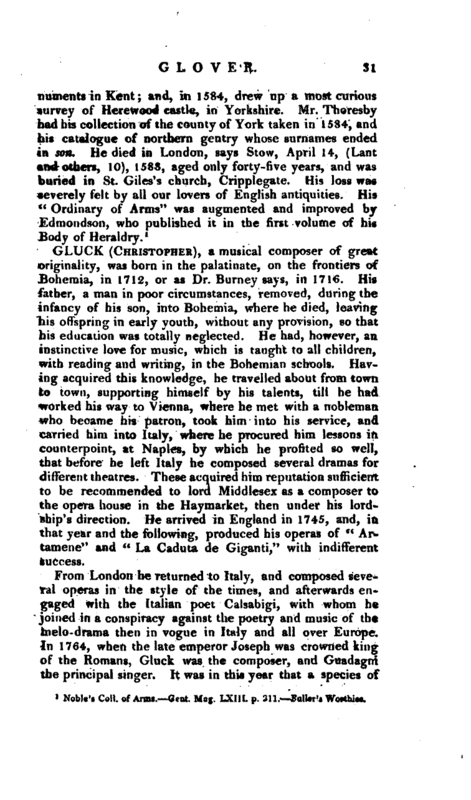 A furious war broke out at | Paris; and these disputes, says Dr. Burney, of musical critics, and rival artists throughout the kingdom, seem to us to have soured and diminished the pleasure arising from music in proportion as the art has advanced to perfection. When every phrase or passage in a musical composition is to be analysed and dissected during performance, all delight and enthusiasm vanish, and the whole becomes a piece of cold mechanism. Rees’s Cyclopædia, by Dr. Burney.